An ancient sight hound depicted on the tomb of Tutankhamon, the Ibizan hound has the ability to jump great heights, is agile, and now works as a scent hound and a family dog. This breed is said to have been used to hunt by the pharaohs of Egypt. Sculptures and paintings from ancient Egyptian tombs around 3000 B.C. 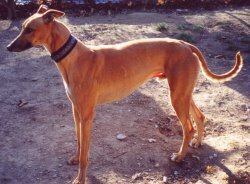 depict a dog bearing a striking resemblance to the Ibizan hound. This was discovered in 1922, when the tomb of Tutankhamon was excavated. In the eighth century B.C., Phoenician and Libyan merchants took this Egyptian dog on a ship to present Spanish Balearic Islands, where it was named after the island of Ibiza. The islanders kept these dogs away from the other breeds and bred them for hunting hare. It was taken to the United States in 1956, and received official recognition by the American Kennel Club in 1979. Like the Ibizan hound, the pharaoh hound is from ancient Egypt. Cheerful and gentle, it is very good with children. A newly recognized breed, this dog is quite rare. Paintings in Egyptian tombs of 4000 B.C. 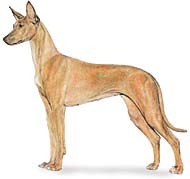 depict dogs bearing a close resemblance to the pharaoh hound. It's said several dogs were taken to Gozo, Malta, and Sicily by Phoenician merchants. On the island of Gozo the locals calls this breed the rabbit dog. 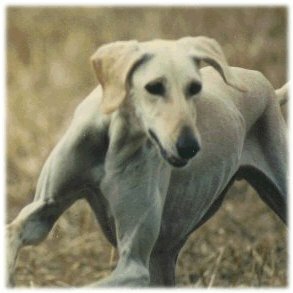 By 1968, eight pharaoh hounds had been exported to England and were recognized by the Kennel Club. This breed was not officially recognized in the Unites Stated until 1983. 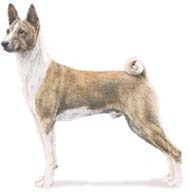 The Basenji have short fur, ranging from red & white, black & white to tri-colored. Recent imports from Africa have been brindle. A mixture of red and black hairs that often resemble a tiger's stripes. This short fur is kept clean by continued grooming. Basenjis are extremely intelligent dogs. A recent book concerning dog intelligence placed the basenji near the bottom of the list. Anyone who knows basenjis, knows that this is false. The listing was based on how easily different breeds can be trained and how well they obey commands. Basenjis can be trained (make that must), but if they find something of greater interest to them, they may ignore the command and continue on their way. Being that basenjis are direct descendants of the first dogs, and that dogs of their type are still found in the wild world wide, it is doubtful that they could survive thousands of years and not be intelligent. The breed basenji is known as the barkless dog. Their vocal folds are not shaped for barking. This additional fact brings them one step closer to all dogs closest relative, the wolf. Wolves, as you may or may not know, cannot bark either. 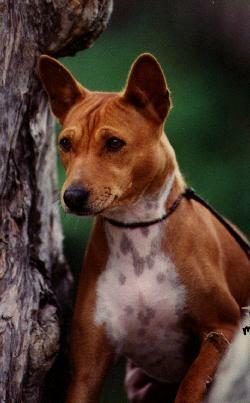 The Basenji is one of the oldest breeds known to man. Ancient Egyptian art works show very clearly, dogs of the basenji's size and shape. Of course, other breeds are also depicted, namely Pharaoh Hounds and Izban Hounds. The Great Pyramid of Khufu (also known as Cheops) has paintings of basenji type dogs seated at the feet of their owners. This pyramid was constructed about 2700 BCE. There are also cave and rock drawings dating from about 6000 BCE in what is now Libya. These paintings show hunting scenes that contain pariah dogs looking very similar to basenjis. European explorers first started describing basenjis in 1870. Affectionate, but not overly demanding. Greyhounds love to be near you or to sit with you on the couch. Body contact is big with these sweet dogs. They develop a strong bond with their person or people. They want to be part of your family and your family activities. Greyhounds are intelligent, independent thinkers. This sweet loving dogs are even mention in the Bible. In Egypt, the ancestors of modern greyhounds were used in hunting and kept as companions. Many Egyptians considered the birth of a such a hound second in importance only to the birth of a son. When the pet hound died, the entire family would go into mourning. The favorite hounds of the upper class were mummified and buried with their owners. The walls of Egyptian tombs often were decorated with images of their hounds. An Egyptian tomb painting from 2200 BC portrays dogs that looks very much like the modern greyhound. Among pharaohs known to own greyhound-type dogs are Tutankhamen, Amenhotep II, Thutmose III, Queen Hatshepsut, and Cleopatra VII. 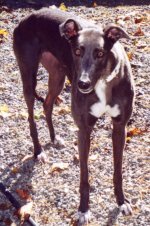 Throughout history, Greyhounds were the pets, hunting dogs and friends of the ancient Egyptians, the Romans, the Greeks and the Medieval European aristocracy. It is only recently that they have been used in the gambling world for racing and are often destroyed as soon as their money-making capabilities are finished. But We can stop this, adopting a retired Greyhound or donating money to help the organizations would be a big help! If you'd like to adopt a Greyhound, please, research about the breed first, to know if it's suitable for you and your lifestyle. Here are some links that can help you with that! You can find more information about the care of Greyhound in the links below! Here are some more organizations that help retired Greyhound get new homes! Here's a page with a great source of information about the rescues in America, find out which is the nearest to you! It also has a lot of information about the care of the breed and more! They were the favorite hounds of the Egyptians, and were known as the Royal Dogs of Egypt. Only nobility were allowed to have them. Many have been found mummified in tombs with their masters, a sign of great favor! There are several good depictions of King Tutenkamen with his favorite salukis. 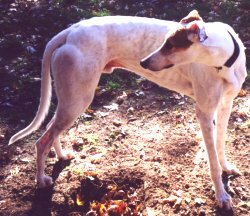 The Egyptians sometimes cropped the hounds' ears -- which you can see in the tomb carvings showing prick-eared, deep chested, long legged hounds. 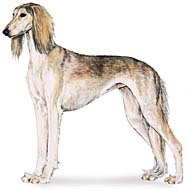 Many of the early salukis were smooths -- identical to their feathered brethren except for the silky hair on ears and tails. If you have a website with information about any of the breeds above, please Thank you!